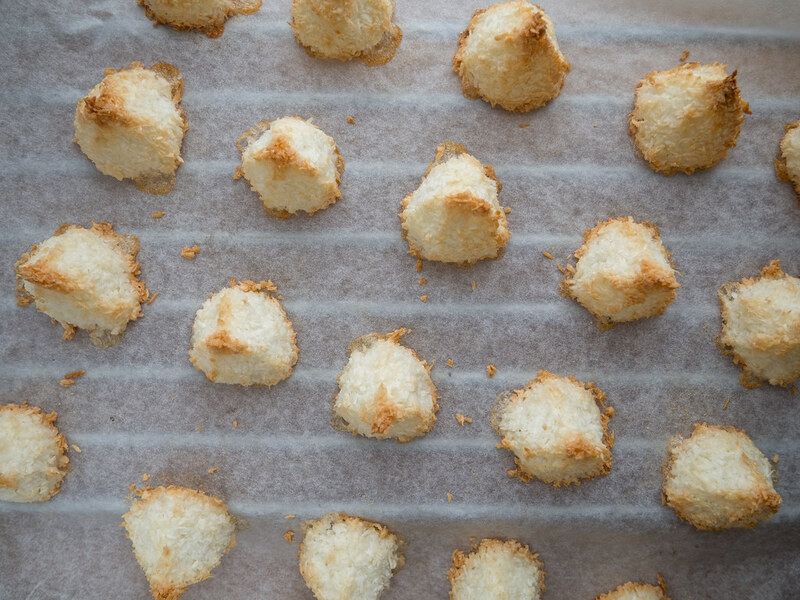 This recipe for coconut macaroons is one of my favorite when it comes to easy-to-make and, at the same time, very delicious cookies. I will not call this recipe a traditional Danish recipe or Nordic for the matter. However, I clearly remember these coconut macaroons from my childhood and how much I loved them – so they are diffidently been around in Denmark for a long time. I have not had them for many years and had completely lost my memory of them. One day I stumbled upon this old recipe for these delicious coconut treats, of course I made a batch as soon as possible. Instantly my good memories of them came back. The origin of this recipe is probably not any of the Nordic countries but it is differently a good choice if you are looking to make a treat that has been popular in Denmark, Sweden and Norway for many, many years. 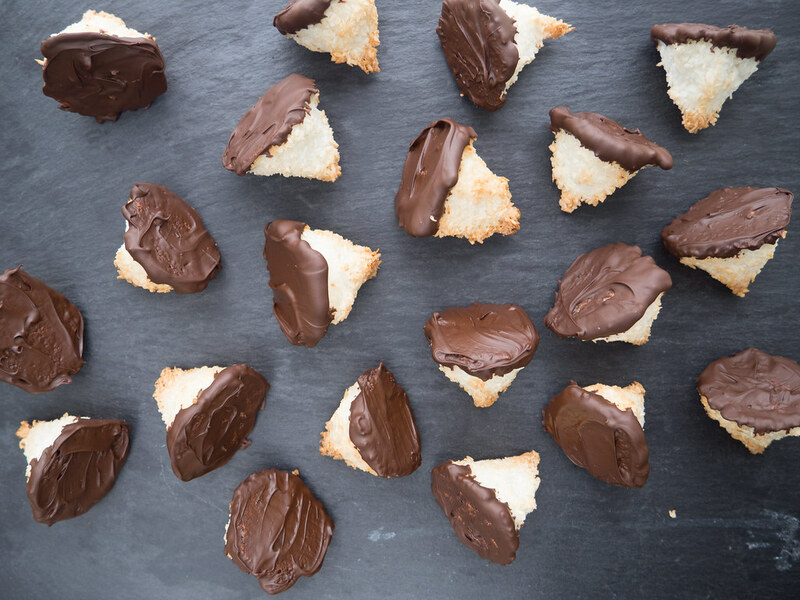 Besides being super delicious, they are also very easy to make and you only need four simple ingredients; sugar, coconut flakes, egg whites and dark chocolate. What I personally like the most about these cookies is the crisp outside combined with the soft inside and the dark chocolate at the bottom – they are, and will always be one of my all-time favorite. As said, they are very easy to make. 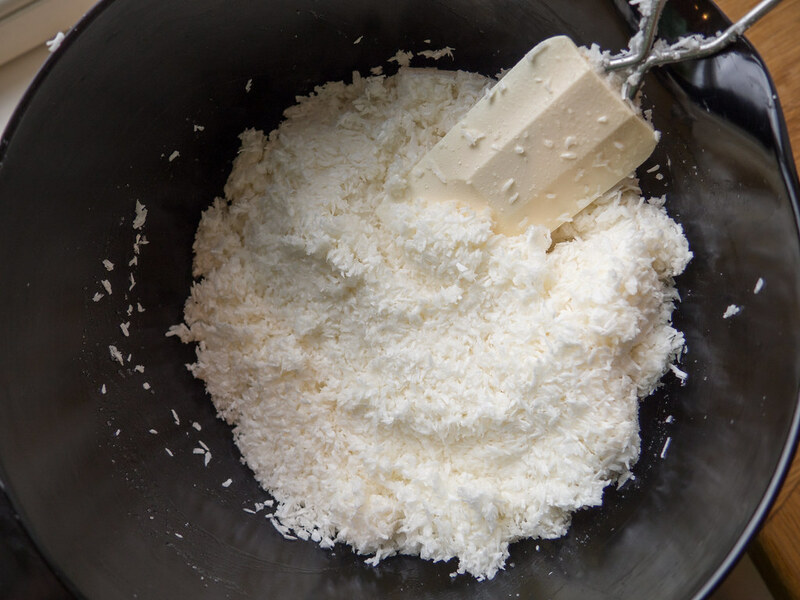 You start by mixing the sugar and coconut flakes. Then separating the egg whites from the yolks. 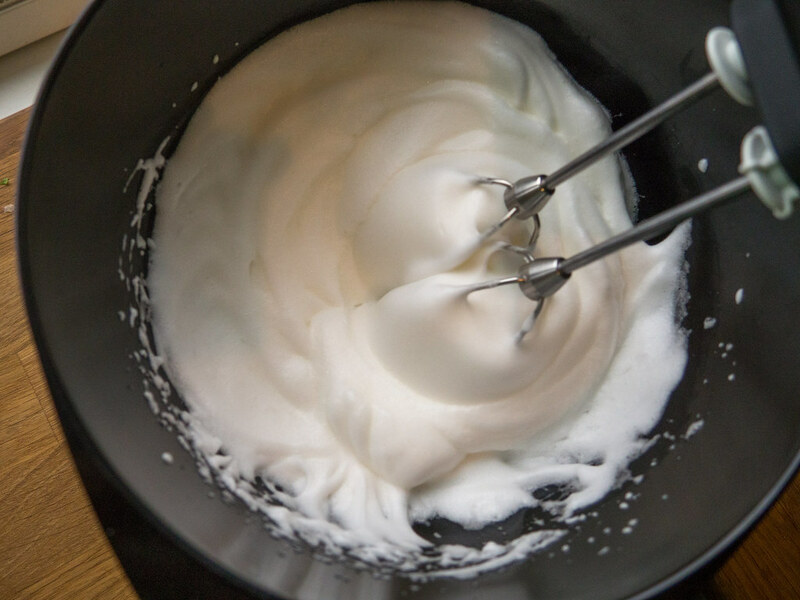 Transfer the whites to a second bowl and whisk them into a fluffy and stiff mixture. You should be able to turn the bowl upside-down and the mixture should stay inside. 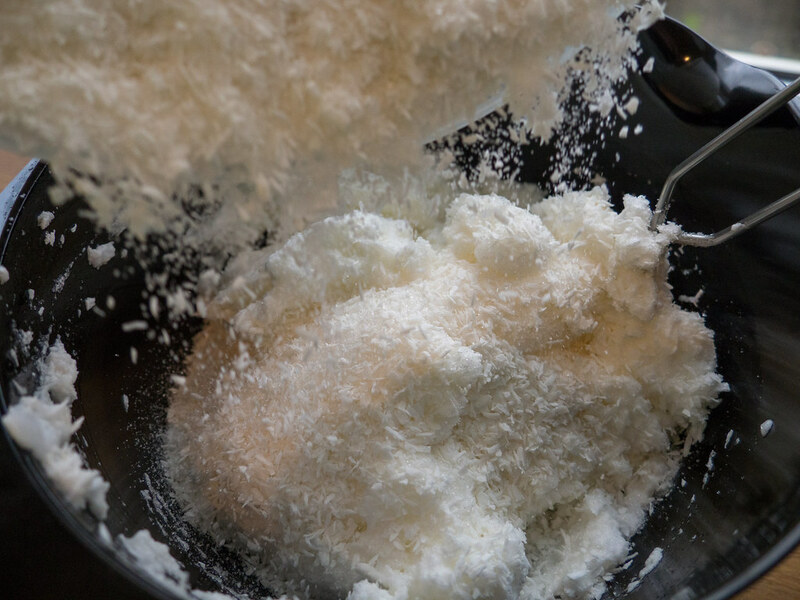 Add the mixed sugar and coconut flakes to the stiff egg whites. Gently, mix everything together. 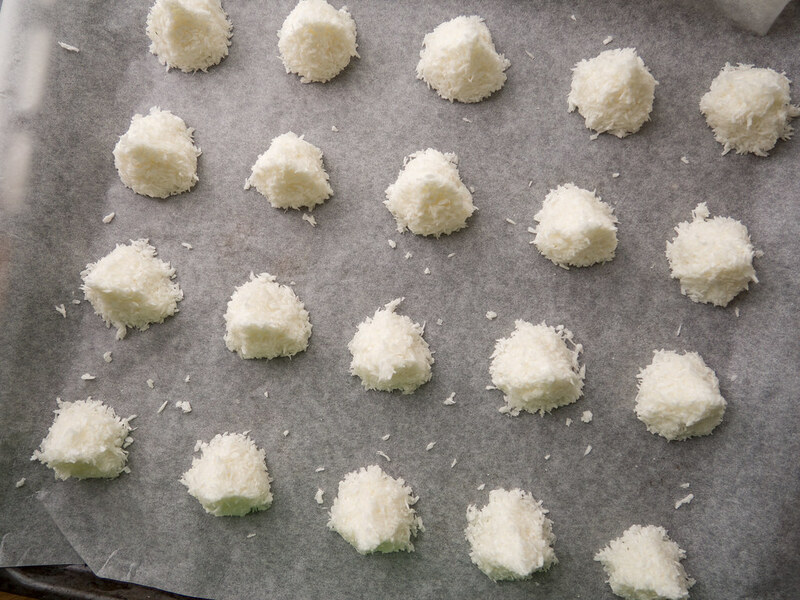 Use a tablespoon and your fingers to create small coconut tops on a non-sticking baking mat. 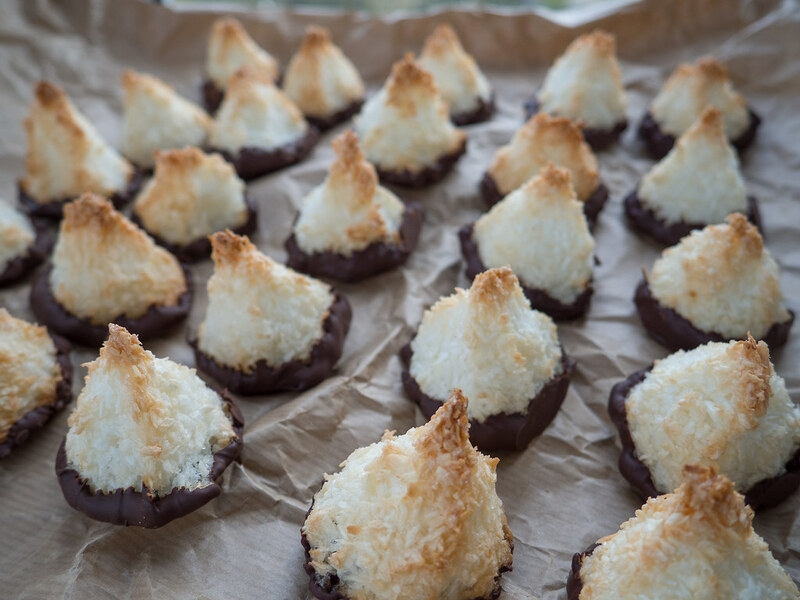 Bake the coconut macaroons for about 8-10 minutes in a 160 C (320 F) degree hot oven. 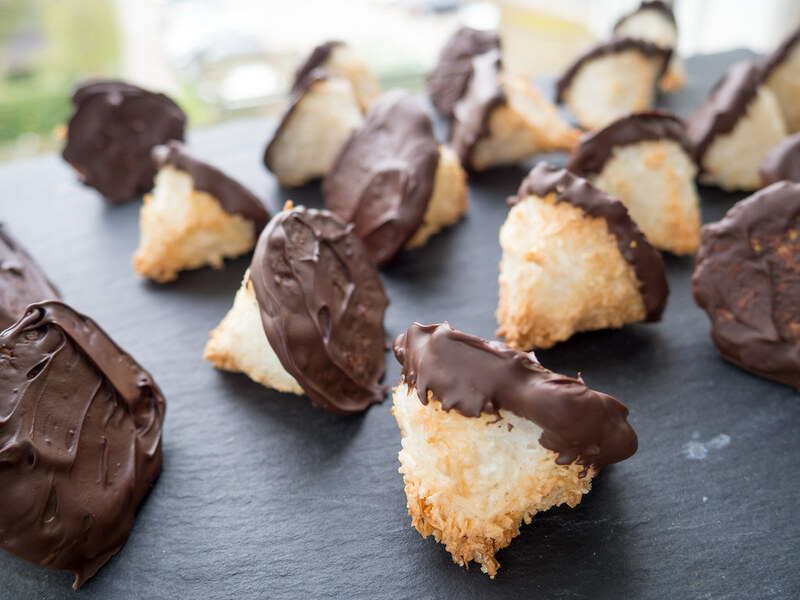 When they are cooled off; melt some dark chocolate and dip each bottom of the coconut macaroons in the chocolate. Let the chocolate harden before eating them. Keep the coconut macaroons in an airtight container for about 2-3 weeks. 1. In a bowl; mix sugar and coconut flakes. 2. 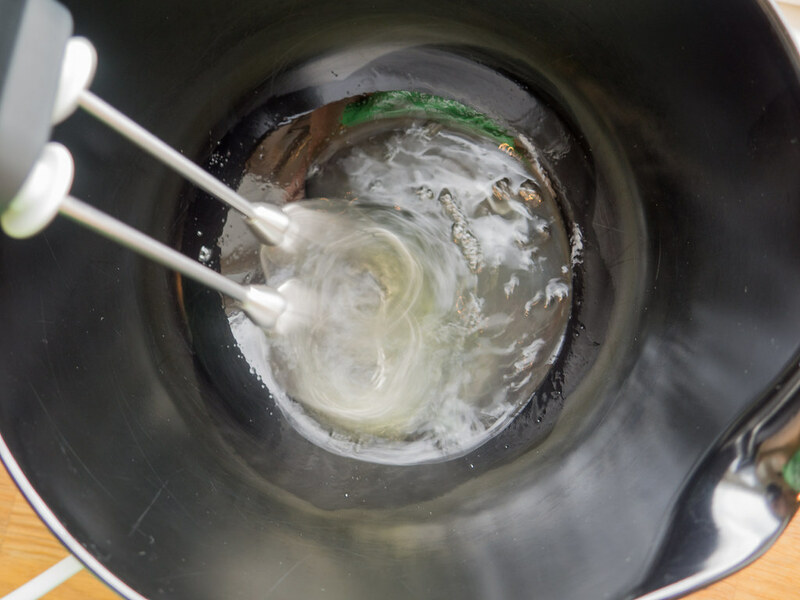 Separate the egg whites from the yolks and transfer the whites to a second bowl. 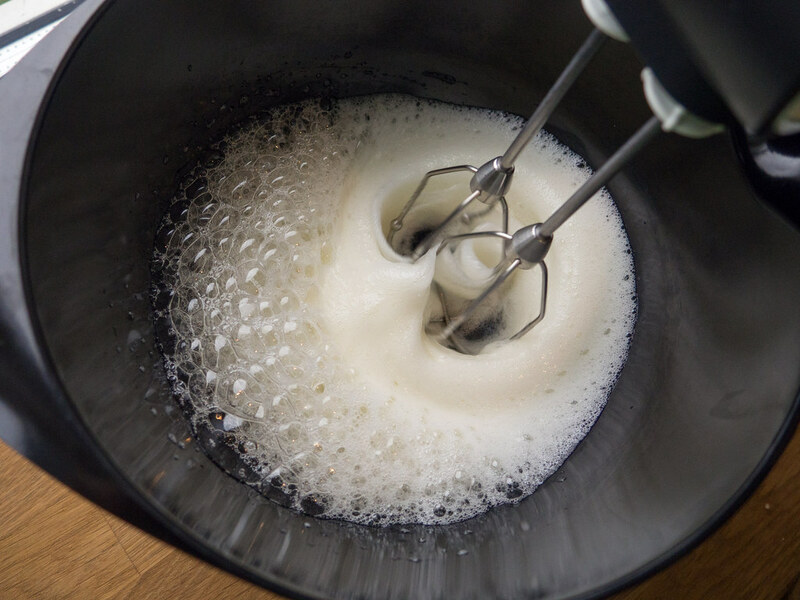 Whisk the whites into a fluffy and stiff mixture. You should be able to turn the bowl up-side-down without the egg whites running out. 3. Add the sugar and coconut mixture to the stiff egg whites. Gently mix the ingredients together. 4. Spoon the coconut dough onto a non-sticking baking pan. 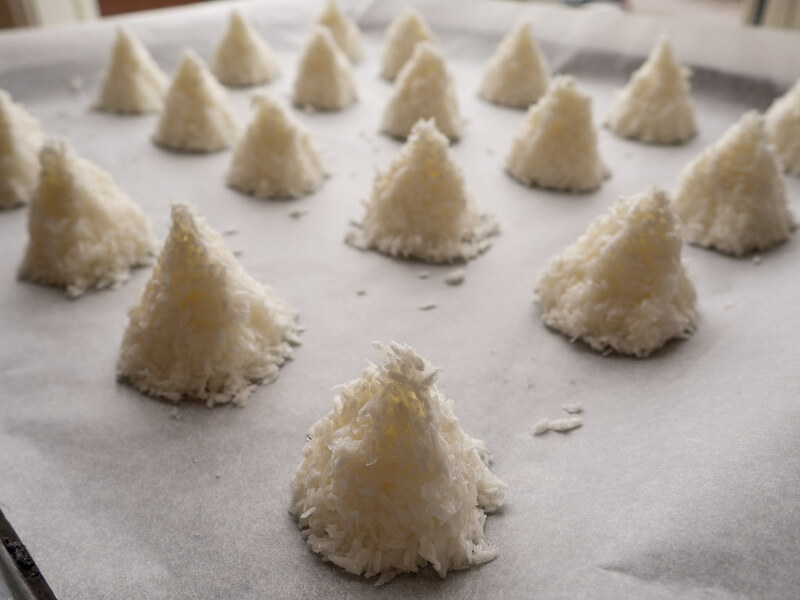 Use your fingers to shape small coconut tops. 5. 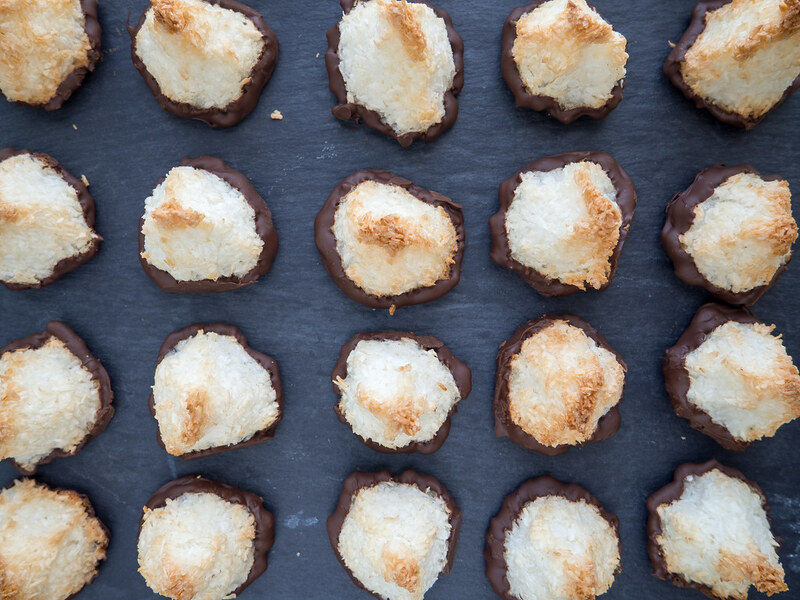 Preheat the oven to 160 C (320 F) and bake the coconut macaroons for about 8-10 minutes. Let them cool off a little before continue to the next step. 6. 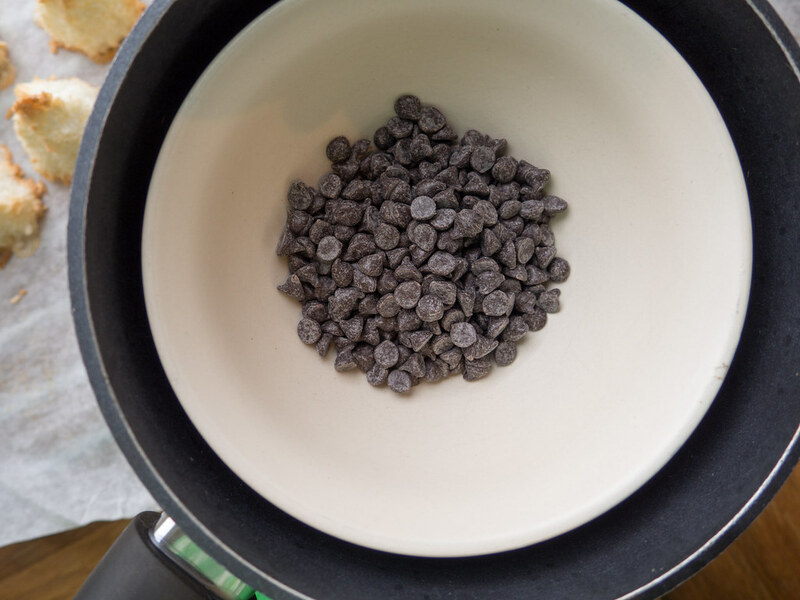 Use a ‘water bath’ to melt the dark chocolate; slowly and gently melt 2/3 of the dark chocolate in a heat proof bowl places over a sauce pan with a little boiling water. Make sure no water gets into the molten chocolate. When all the chocolate is melted, turn off the heat and add the last 1/3 of the dark chocolate. Stir a little in the hot chocolate making the last 1/3 of the chocolate to melt as well. 7. 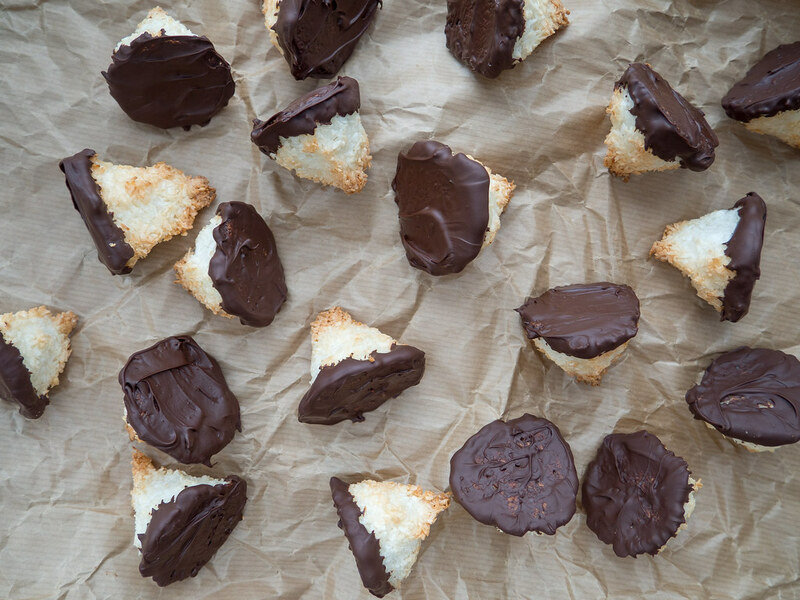 Dip each bottom of the coconut macaroons in the chocolate and let them dry on a sheet of parchment paper. Lovely! Any idea how long these will keep in the fridge? Thanks for the great recipe and helpful photos! I would just keep them in a can for about 2-3 weeks.